Nearly everyone experiences some form of lower back pain and one point in their life. The lumbar region, located just under the ribcage, is where lower back pain can be most clearly felt. Low back pain is one of the most common reasons people miss work. Why am I feeling lower back pain? Your lower back supports the weight of the upper body, which provides mobility for everyday motions like twisting and bending. Lower back muscles are responsible for rotating and flexing the hips while walking or running, as well as supporting the spinal column in general daily life. Lower back nerves supply sensation and power the muscles in the feet, pelvis, and legs. 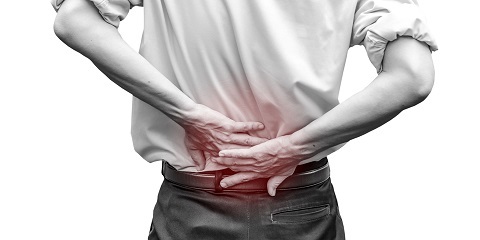 Most intense low back pain results from injury to the muscles, discs, ligaments, or joints. The body reacts to injury by mobilizing an inflammatory healing response, and while inflammation sounds minor, it can potentially cause severe pain. The most common cause of lower back pain is a torn or pulled muscle and/or ligament. This can happen by lifting a heavy object, improper form working out, a fall, and sports that involve a lot of twisting or large forces of impact, as well as other potential injuries. Common activities like extended periods of time sitting at desks can also lead to persistent lower back pain. Who is most susceptible to lower back pain? Individuals often dealing with heavy lifting are highly susceptible to low back pain from all the lifting and lowering activity. Gym goers and athletes are also at risk from improper form lifting weights and potential sprains from sport activities. Even office workers – who happen to spend large amount of times sitting at a desk – are susceptible to lower back pain. It’s a universal issue that affects just about anyone. When should you see a health practitioner? Seeking physiotherapy help is recommended at any time to alleviate lower back pain. If your condition feels more persistent or serious, then seeing a physiotherapist is essential towards addressing the pain and discomfort. Body Dynamics offers a range of products and services that are specially suited to address lower back pain. Come in or contact us for a consultation to work on removing your lower back pain and getting you back to feeling comfortable.